A sequence featuring music and sounds from the two Voyager spacecraft chosen to help passing aliens understand human beings and their world, 1977-style. 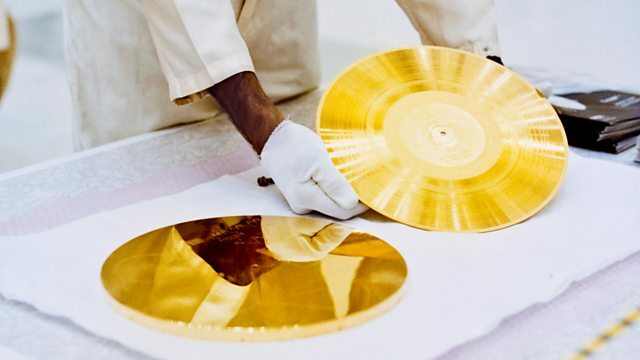 When NASA launched the two Voyager spacecraft in 1977, set incongruously among the on-board scientific instruments was the Golden Record, a sort of cultural handshake from humankind (or at least a NASA-approved version of it). The disc was optimistically intended for any passing alien to set up and play in order to hear a representative selection of the world's sounds and music. Hand-etched on its surface were the words 'To the makers of music - all worlds, all times'. This un-presented sequence is made up from the music and sounds on the Golden Record, from Bach to Chuck Berry, Stravinsky to Australian aboriginal song; from erupting volcanoes and a small selection of the world's fauna to heavy industrial machinery and trains, planes and automobiles. Not to mention greetings in fifty-five languages and a personal 'hello' from 1977 UN Secretary General, Kurt Waldheim. 'To the Makers of Music - All Worlds, All Times' is a chance to imagine yourself as an alien in a distant galaxy in whose back garden a Voyager spacecraft has landed. Somehow, you've been able to follow the instructions which come with the Golden Record and, luckily, your auditory sense and your planet's atmosphere enable you to hear what's on it. Are you any the wiser about planet earth and its inhabitants? Or perhaps just a little perplexed? Is it time to get back to the gardening, plan an invasion or extend the hand (tentacle) of friendship? You decide. Exploring what makes music a vital part of being human. Performer: Munich Bach Orchestra, Karl Richter (conductor). Performer: Louis Armstrong and His Hot Seven. Performer: Recorded by Charles Duvelle. Performer: Columbia Symphony Orchestra, Igor Stravinsky (conductor). Performer: recorded by Sandra LeBrun Holmes. Performer: Early Music Consort of London. Performer: collected by Casa de la Cultura, Lima. Court gamelan, "Kinds of Flowers"
Performer: recorded by Robert Brown.